Cyber Week Special - Save $150! Nancy Smyth has been working with commercial/ government construction contractors for more than 20 years, with her primary focus being contractors using QuickBooks financial software who must adhere to ever-changing prevailing wage laws. As president of Sunburst Software Solutions, Inc., she is a key player in the development of several QuickBooks add-ons for the construction industry. She also writes the “QuickBooks for Contractors” blog. Van Allyn Goodwin, Littler Mendelson P.C. 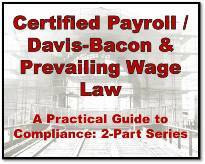 This 90-minute webinar will provide you with the information you need to understand the specific requirements of the Davis-Bacon Act, when it applies, and the process necessary to ensure compliance and avoid enforcement actions and potential penalties. Failure to comply with the Davis-Bacon Act can have dire consequences, including debarment and the loss of a major source of business, in addition to the exposure to substantial damages and attorneys’ fees. This webinar will enable you to ensure you are satisfying the Davis-Bacon Act when competing for and performing federal public works and construction contracts. Gather your team for maximum benefit -- Perfect Training Opportunity! Education Credits: Certificates of completion available upon request for PDUs/PDHs.